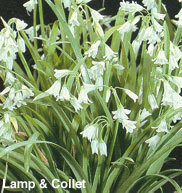 Growth Habit: Three cornered garlic has an average height of 30 to 50cm. Type of Plant: A bulbous perennial. Flowers: White, star shaped with five petals, often nodding. Flowering occurs through spring. Dispersal: It reproduces by seed or vegetatively. Distribution: Found along roadsides, wasteplaces and highly cultivated areas in south-east Australia. Status: Secondary weed in Tasmania. Can taint milk and meat however stock tend to avoid it due to its onion-like flavour. Capable of forming dense colonies on grassland areas. Grubbing. Remove manually and ensure all bulbs are removed otherwise the plant will reshoot. Herbicide. Spot spray. Herbicides registered in Tasmania include dicamba, MCPA, metsulfuron and glyphosate.